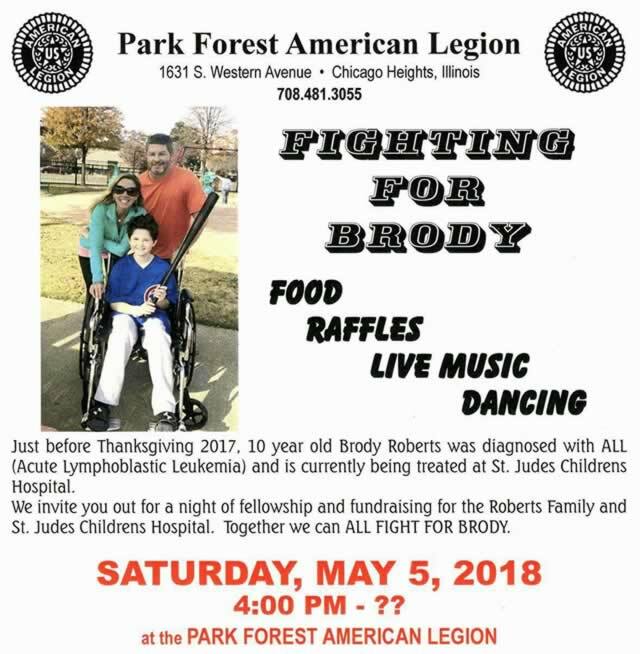 The Park Forest American Legion will host Briskets for Brody, a fundraiser for Brody Roberts, son of Deputy Fire Chief Ryan Roberts, who continues his fight against leukemia. Park Forest, IL-(ENEWSPF)- Village Manager Tom Mick provides a report to members of the Village Board at Monday meetings. Besides community events, Manager Mick highlights job opportunities, updates the board and the public on Village issues, and requirements — like vehicle stickers — the public, and board members, need to keep in mind. This week, Mr. Mick spoke of an upcoming honorary street dedication in recognition of Officer Tim Jones, and a Saint Patrick’s Day fundraiser for Brody Roberts, son of Deputy Fire Chief Ryan Roberts. All proceeds from the fundraiser event will go to the Roberts family as young Brody continues to battle leukemia. Park Forest vehicle stickers for 2018/2019 went on sale on March 1st. Stickers are required to be purchased and posted on vehicles by no later than April 30th, the Manager said in his report. On a final item about the vehicle stickers for this year, they have a decidedly Park Forest-specific theme. The artwork on the sticker was created by Park Forest resident and artist, Patricia Moore, who was the 2016 Business Person of the Year in Park Forest. Additionally, the stickers were printed by a local business by the name of ImageWorks. ImageWorks is a global business specializing in unique advertising projects and is located on South Street in Business Park. The Village of Park Forest is now recruiting for the full-time position of Building Maintenance Specialist. 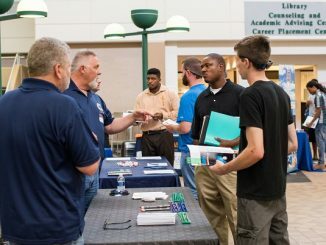 Residents seeking more information on this opportunity can click on the “Employment” link of the Village of Park Forest home page. The application deadline is March 15th. The Tall Grass Arts Association will host its annual “Beaux Arts Ball” fundraiser on Saturday, March 17th. The theme will be An American in Paris and special honorees will be State Representative Al Riley and longtime Park Foresters Al & Barbara Sturgis. For more details on tickets or the event, please visit the Tall Grass Arts Association web site at www.tallgrassarts.org or call the Tall Grass Arts Gallery at 748-3377. Also on March 17th, a fundraiser will take place for Brody Roberts, son of Deputy Fire Chief Ryan Roberts. It will be called Briskets for Brody and will take place on from 5 to 8 PM on St. Patrick’s Day, Saturday evening, March 17th at the Park Forest American Legion. For more details, visit the Park Forest Fire Department’s Facebook page or call the American Legion at 481-3055. All proceeds from the event will go to the Roberts family as young Brody continues his fight against leukemia. The 2018 Gardening Lecture Series, as sponsored by the Environment Commission, will continue this coming Saturday, March 10th with the topic of “Bring it Outside: How to start plants, harden off your seedlings, and accustom your houseplants to the great outdoors.” The session will start at 10:30 AM in the Wetlands Discovery Center. Plans are in the works to dedicate a portion of Lakewood Boulevard after Police Officer Tim Jones. The section of Lakewood, to be noted as Honorary Officers Tim Jones Way, will be from Orchard Drive to Forest Boulevard and the sign will be blue. The agenda item for this will be in front of the Village Board with the March 19th Regular Board Meeting – which marks the 2 year anniversary of the incident involving Officer Jones. The goal is to have an official unveiling of one of the signs on March 19th with the hopes that Officer Jones and his family will be in attendance. Then, if their scheduling allows, Tim will be at the Board Meeting for official presentation of a sign to him and his family. The Recreation & Parks Advisory Board is planning an Easter Egg-stravaganza from 11 AM to Noon on Saturday, March 24th on the Village Green. Intended for kids ages 13 and younger, the event is open to the public and free of charge. However, registration is required prior to the event. For more details, please call the Recreation & Parks Department at 748-2005. The Park Forest Aqua Center wants residents to know that they are now offering early bird registrations for the 2018 Swim Season. And while the calendar says we are in the first week of March, summer will be here before we know it. For more details, call visit the Village web site or call the Recreation and Parks Department at 748-2005. For anyone who might be observing Lent, the annual Lenten Fish Fries will take place in the gymnasium at St. Irenaeus Church every Friday through the end of March. “I’ve had some residents ask recently about where to go for a good fish fry and I always tell them to go St. Irenaeus,” Mr. Mick said. The feast takes place each Friday during Lent, 5 to 7 PM, with offerings including cod, shrimp, mac n’ cheese, green beans and more.